We had this for dessert last Saturday and Amy said I need to post the recipe. Studded with plenty of berries this ice cream will put anything store-bought to shame. Feel free to add blueberries or raspberries, too. Place strawberries, vanilla and sugar in saucepan and bring to a simmer, stirring occasionally. Remove from heat and chill. Combine chilled berry mixture with cream. Add additional sugar if you like. Remember that once it is frozen the ice cream will not taste as sweet so make this mixture a little sweeter than you want the final product to be. How much sugar you add varies with personal taste and how sweet the berries are. Place in an ice cream maker and process according to manufacturer’s directions. Once finished put in an air- tight container and place in freezer. Makes about 1 quart. I was looking for a seasonal dessert for dinner with friends. 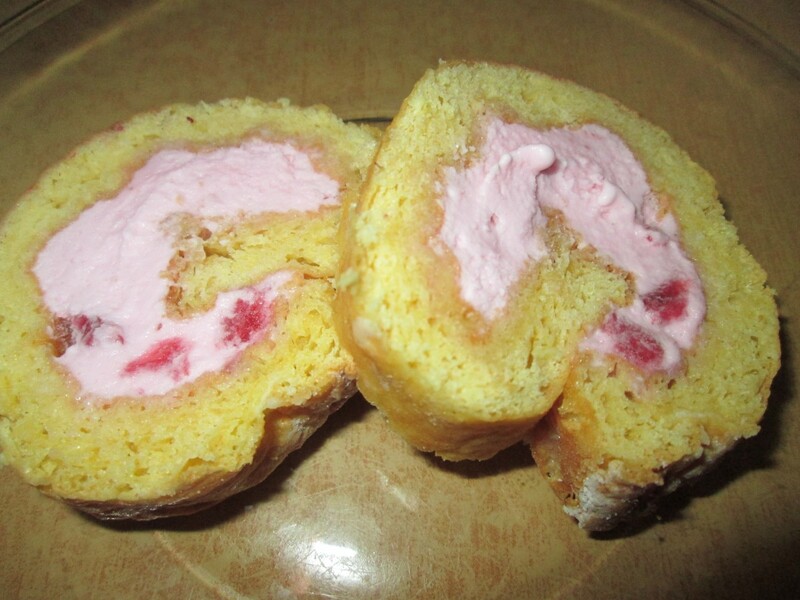 Since the weather has been getting warmer I decided to make a cake roll and fill it with ice cream. 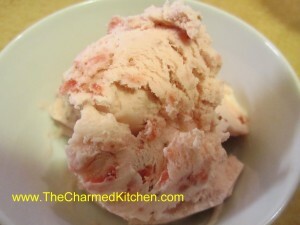 I used homemade strawberry ice cream, recipe follows. You could use store bought ice cream, if you prefer. 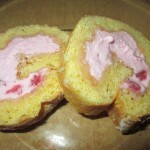 Start with the sponge cake roll recipe below and use whatever flavor ice cream you like. You’ll need about a quart of ice cream- or a little more. 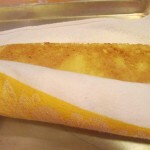 This sponge cake roll can be filled with whipped cream or ice cream, or use your favorite filling. Beat egg yolks until thicken and lemon colored; gradually add 1/3 cup of the granulated sugar, the lemon juice and the lemon zest. Beat egg whites until almost stiff then gradually beat in the remaining 1/3 cup sugar. Beat until stiff peaks form. Fold yolk mixture into whites. 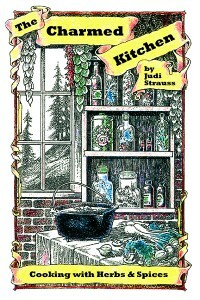 Sift dry ingredients into a separate container; add to egg mixture, folding in carefully. Fold in melted butter. Pour batter into waxed paper-lined 10x15x1-inch jelly roll pan. Bake at 375° for 12 minutes. Sprinkle with confectioners’ sugar. Turn onto a clean kitchen towel which has been generously dusted with confectioners’ sugar. 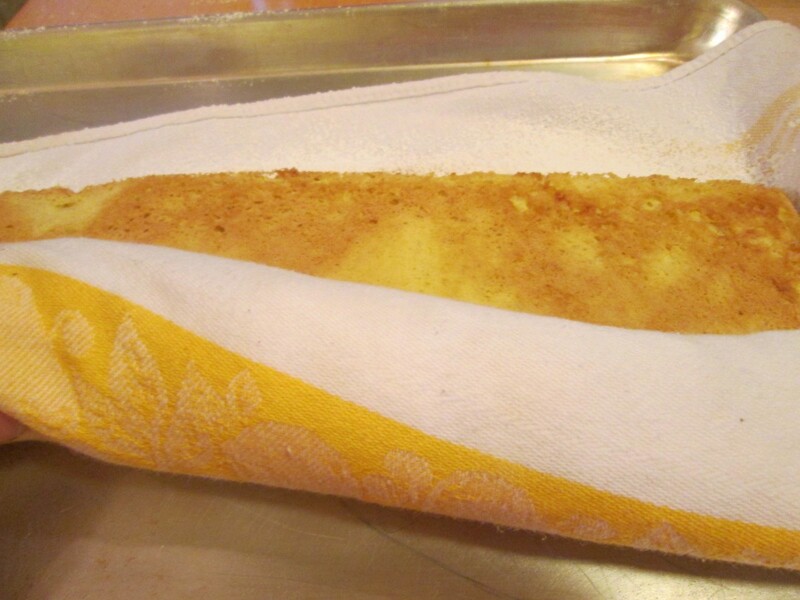 Trim edges, if necessary; roll cake up, towel and all, while still warm. Let cool completely. 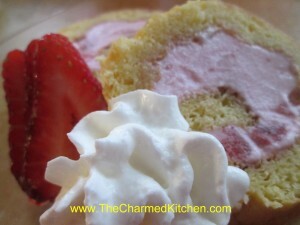 Unroll and fill with whipped cream or ice cream then re-roll cake. The trick is to let the ice cream soften up a few minutes before spreading it on the cake. But don’t wait too long. Rather than trying to let the ice cream get soft enough to spread I used a spatula to sort of cut slices of ice cream and place them on the cake. 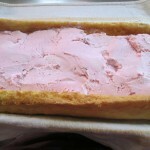 Store ice cream cake roll in freezer until ready to slice and serve. *If you don’t have cake flour you can make your own. Measure out a cup of all purpose flour, remove 2 tablespoons of flour and replace them with 2 tablespoons of cornstarch. For larger amounts place 7 cups of flour in a bowl and combine with 1 cup of cornstarch. Mix well or even sift together. Store in an airtight container. 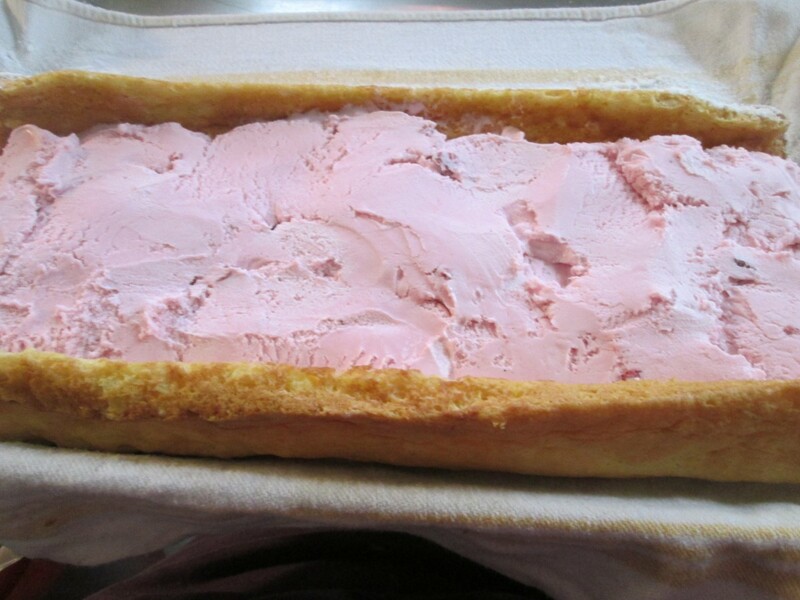 Spread softened ice cream over cake and re-roll. Place strawberries, vanilla and sugar in saucepan and bring to a simmer, stirring occasionally. Remove from heat and chill. Combine chilled berry mixture with cream. Add additional sugar if you like. Remember that once it is frozen the ice cream will not taste as sweet so make this mixture a little sweeter than you want the final product to be. How much sugar you add varies with personal taste and how sweet the berries are. Place in an ice cream maker and process according to manufacturer’s directions. Once finished put in an sir- tight container and place in freezer. Makes about 1 quart.